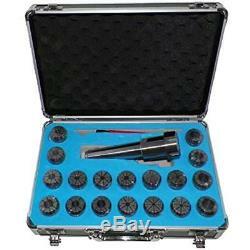 MT4 ER32 Collet Chuck Tool Holder Set 18 Pcs ER32 Collets Holder Prime Quality. 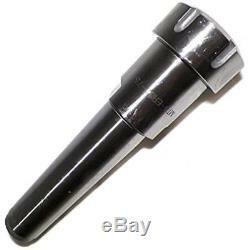 Made of alloy steel and hardened to HRC 60-62. 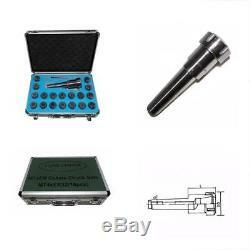 R: 0.0001 18Pcs collects, one 4MT collets holder, and one wrench are included in the package. Taper: Morse Taper 4 MT4. Alloy steel and hardened to HRC 60-62. Back Bar Thread :M16 x 2.0P. 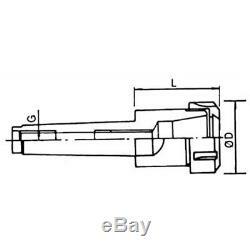 1 pc MT4 collets holder, 18 pcs ER32 collets, 1 wrench. Collets Size: 1/8, 5/32, 3/16, 7/32, 1/4, 9/32, 5/16, 11/32, 3/8, 7/16, 15/32, 1/2, 9/16, 19/32, 5/8, 11/16, 23/32, 3/4 inch. Thank you for your business, your trust and your confidence. It is our pleasure to work with our customers. If you have any question. We reply every message within 48 hours. If you did not receive our reply. We think maybe we did not receive your message. Please send us message again. Our feedback is VERY important to us. 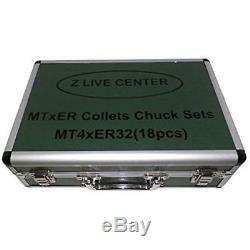 The item "MT4 ER32 Collet Chuck Tool Holder Set 18 Pcs Collets Prime Quality" is in sale since Friday, August 3, 2018. This item is in the category "Business & Industrial\CNC, Metalworking & Manufacturing\Workholding & Toolholding\Toolholding\Arbors & Adapters". The seller is "comerziio" and is located in New York, New York. This item can be shipped to United States.